FRANKLIN COUTNY, Mo. - Deputies of the Franklin County Sheriff’s Office will be conducting sobriety checkpoints during the week of June 23-29th. Funding to operate the sobriety checkpoints are being paid for via alcohol related grants provided by the Missouri Department of Transportation Highway Safety Division. Pictured is an general photo of what a Timber Wolf looks like. The missing Timber Wolf has been described as being gray in color. We are working on obtaining an actual photo and will keep you updated. ROBERTSVILLE, Mo. - Moments ago Franklin County Sheriff Gary Toelke said this morning at approximately 1:30 a.m the Sheriff’s Office received a reported sighting of the missing Timber Wolfe from the Robertsville area. At the same time, a resident on Jenny Lane (see map below) reported her dog was missing. BERGER, Mo. - Tuesday afternoon at approximately 1:00 PM, Franklin County Sheriff Gary Toelke said earlier this morning that deputies responded to a residence in the 7000 block of Zero Road in reference to a gunshot victim. The investigation revealed that Merle Winford Jr. a white male, age 53 from Jonesburg, Mo, had suffered what appeared to be a self-inflicted gunshot wound to the chest. VILLA RIDGE, Mo. 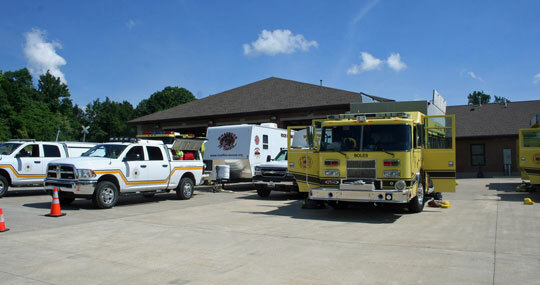 - The Boles Fire Protection District Annual Safety Day and Missouri Child Identification Program (MoCHIP) Event will be held on Saturday, June 21st from 10 a.m. to 2 p.m. 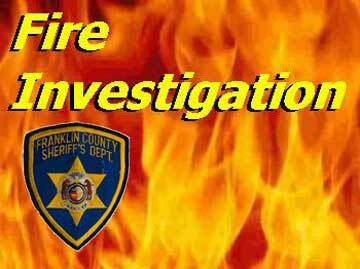 The event will be held at 233 Hwy M in Villa Ridge at the Boles Fire House Station #3. This free public event will include Carseat Checks, Bounce House, Refreshments, Safety House with Severe Storm Simulator, Fire Trucks, and Meramec EMS will be doing blood pressure checks. BERGER, Mo. 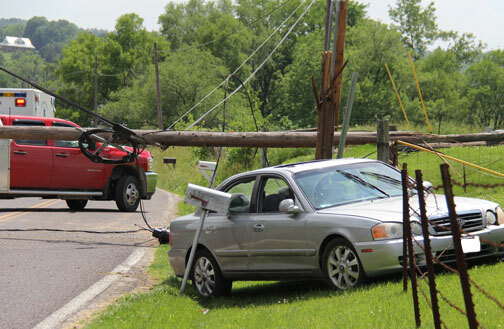 - Early Tuesday afternoon at 2:10 p.m. Hermann EMS and New Haven/Berger Fire Crews responded to the 400 block of Market Street for a vehicle into a utility pole. JEFFERSON CITY, Mo. - Eight people died in traffic crashes over the 2014 Memorial Day weekend compared to last year when six people were killed. All eight of the individuals killed this year were not wearing a seat belt. During the Memorial Day weekend the Missouri State Highway Patrol (MSHP) investigated 295 traffic crashes which included 130 injuries and the eight fatalities. 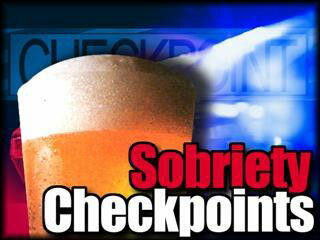 Troopers also arrested 146 people for driving while intoxicated. Pictured Left to right: Brad Eisenbath, District Sales Manager for Monsanto, Assistant Chief Brian Strubberg, and Lyle and Evelyn Scheible. NEW HAVEN, Mo. 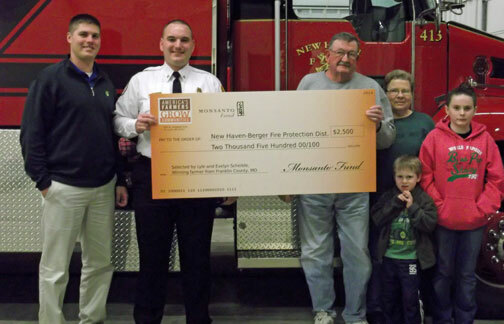 - The New Haven-Berger Fire Protection District has just completed a months long transition into upgraded radio equipment. In January of this year the District purchased used radios from the Cedar Hill Fire Protection District, needing only new batteries to put them to use. NEW HAVEN, Mo. 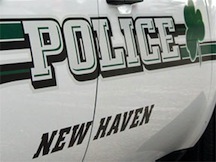 - The New Haven Police Department recently participated in the May 1-12 Drunk Driving crackdown. While no intoxicated drivers were found in New Haven, Officers did make a total of 66 car stops, and issued several citations for speeding, running stop signs, C and I driving, and driving with suspended licenses. In addition, the officers made one felony stop, taking into custody a subject wanted for questioning in a sexual abuse case. There was also a warrant arrest, and New Haven officers assisted Franklin County detectives in locating a large cache of stolen weapons from the Sullivan area. Memorial Day Weekend - Throughout the weekend Missouri State Troopers will be participating in Operation C.A.R.E. (Combined Accident Reduction Effort). 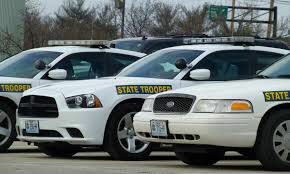 Additional enforcement projects include the statewide 20-Mile Trooper project that consists of troopers maximizing visibility by being assigned to 20-mile stretches of Interstate 44 and Interstate 70. The troopers assigned to both projects will be tasked with vigorously enforcing all traffic laws and helping any motorist that needs assistance. All available troopers will be assigned regular patrol duties over the holiday weekend.